Abducted as a child-heiress, Honor Larke escapes to London seeking justice from the only lawyer she knows: the brilliant Sir Thomas More. With More as her affectionate guardian, Honor grows to womanhood, when the glitter of the royal court lures her to attend Her Majesty, Queen Catherine of Aragon. But life at Henry VIII’s court holds more than artifice for an intelligent observer, and Honor knows how to watch—and when to act. . . . Angered by the humiliation heaped upon her mistress as Henry cavorts with Anne Boleyn and presses Rome for a divorce, Honor volunteers to carry letters to the Queen’s allies. It’s a risky game, but Honor is sure she’s playing it well—until she’s proved wrong. Richard Thornleigh may cut a dashing figure at court, but Honor isn’t taken in by his reckless charm. Only later does Honor realize that Richard has awakened something within her—and that he, too, has something to hide. . .
For the King’s actions are merely one knot in a twisted web that stretches across Europe, ensnaring everyone from the lowliest of peasants to the most powerful of nobles. Swept away in a tide of intrigue and danger, the Queen’s lady is about to learn everything: about pride, passion, greed—and the conscience of the King. . . . Here I sit and *sigh* as I type this review hanging my head, I can't believe that it has taken so long to read this book The whole series has been sitting on my shelf for a number of years. 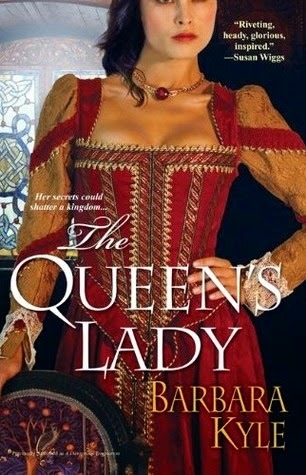 or maybe I was thinking that I couldn't handle another Anne Boleyn story. How mistaken I was! from Catherine of Aragon to the religious conflicts to Thomas More, Anne Boleyn and more. However, the two main protagonist are fictional and I wasn't sure what I would think of that. there was a lot going on, mystery, intrigue, romance, conflicts and more. Margaret, I'm delighted that you enjoyed The Queen's Lady. Many thanks for your very kind words about the audiobook. I'm going to open a contest in a few days in which 5 winners will get a free audio book of their choice of the Thornleigh novels. Do enter! Details will be in my upcoming newsletter. If you - or any of your followers - would like to sign up to receive my newsletters just shoot me an email at bkyle(at)barbarakyle(dot)com. Thanks again!